“Denver-based Sage Hospitality today unveiled the new design for the proposed hotel along Lower Broadway after having filed with the Metro Planning Commission an amendment to the zoning approved for the project last year. Sage started the process with the Nashville Metro Council a month ago but had no images of the redesign until today. Now dubbed Broadway Hotel, the project is shorter than originally approved and doesn’t contain condominiums. The proposed number of rooms increases from 375 to 457. Earl Swensson Associates and Hawkins Partners handled the redesign and made it more friendly to the historic facades along Broadway. The planning commission takes up the amendment on April 24. Council has the amendment on the public hearing meeting for May 6 and could be approved at the next meeting in May. The hotel flag may or may not be Westin. But the developer says the hotel would be four-star quality. Despite the tight credit markets, Sage is confident the money can be obtained to build the project. A major positive is Nashville’s hotel market in general continues to get stronger occupancy and higher rates, particularly downtown. 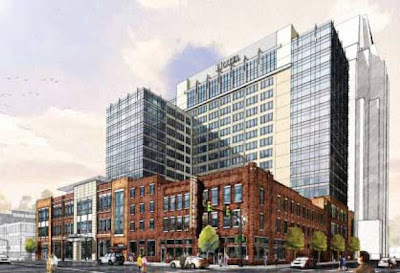 This project is not connected to the new Nashville convention center, but is certainly connected to the expected demand. In my opinion, Nashville lacks a good selection of 4 star hotel options and could absorb another 2-3 luxury brand hotels.